Bill and his staff did a great job in hosting the 2007 Dakota Territory Gun Collector's Show in Fargo. 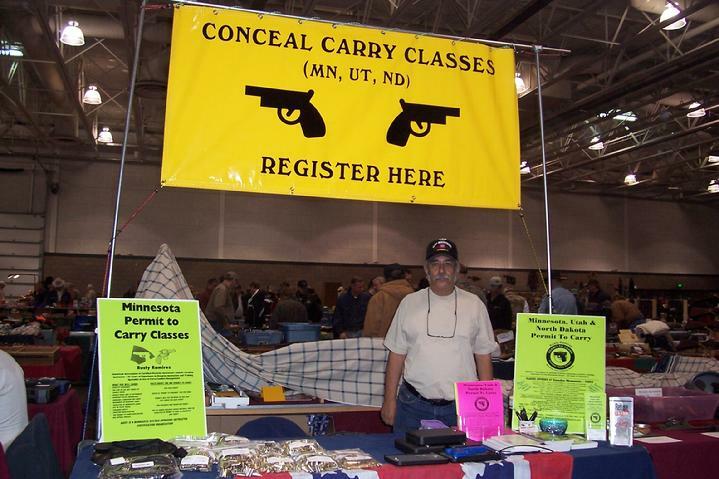 Click on the Fargo - Dakota Territory Gun Show link to see the winners of the Gun Displays. Click on the below pictures to see a larger version of the picture. See you at the Grand Forks Gun Show! Rusty at the 2007 Fargo Gun Show - obviously my favorite table! He looks so serious, maybe he is thinking about the guns he wants to buy! John has quite a display of Iraq memoribilia - Love that US Flag! John is a great supporter of our troops. Lyle Torno and Dennis Sunby are collectors of and display their vintage military items. Dennis Sundby displays his own "personal carry" gun. Dennis is a collector of vintage military items. 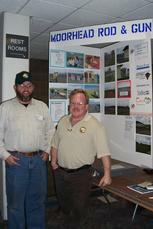 Mike Johnson and Shawn Spears of the Moorhead Rod and Gun Club - good news on the horizon! Doc Neilson, Wild River Rose, Calico Cara and Loyel Manning of the Sheyenne Valle Peacekeepers. Visit their web site at www.sheyennevalleypeacekeepers.com. Klatch, Zee, Rooster and Toby - Members of the Plainsmen Black Powder Club.